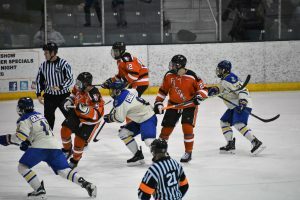 The early part of the season has been tough on Northern Michigan, who coming off a fantastic season last year was hoping to start out strong, but they have faced three ranked opponents before this weekend (#4 St. Cloud State, #9 Bowling Green and #17 Cornell), before coming to Sault Sainte Marie and taking on the new #20 Lakers. Of the three previous series, Northern has stolen one game from Bowling Green, a 2-0 shutout for Atte Tolvanen, who has come out of nowhere for the Wildcats over the last few seasons. NMU’s top three scorers for the year involve a pair of senior defencemen – Troy Loggins and Adam Rockwood, and surprisingly a defenseman, Philip Beaulieu. In terms of straight goals, you can add Darien Craighead to the list, a junior with 5 goals on the year. Grant Potulny, 25-15-3 in his second season at Northern Michigan has been riding Atte Tolvanen in net, who has appeared in all 12 games this season. It’s only 12 games in, but one has to imagine that Tolvanen has got to be feeling that workload, and the Lakers may be able to exploit that this weekend. The Lakers this year have been on a bit of a wild ride. 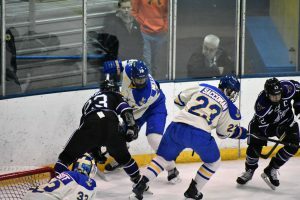 Starting the season with sweeps at both Merrimack and Alabama Huntsville, stealing a game from #12 Michigan, getting swept by an upstart Alaska team and really giving it to Bowling Green 5-0 Friday night. If you’ve been following some of the various media outlets for college hockey, it’s been a fun week being a Laker fan. Anthony Nellis was featured in a USCHO article, the Lakers were ranked #20 by USCHO with 78 points, Sault native Ashton Calder scored his first collegiate goal; was named WCHA Co-Rookie of the week; and that goal was also the game winner in the 5-0 blowout of Bowling Green which also made the WCHA Plays of the Week. Hopefully the team doesn’t eat too much turkey tonight, as they’ll need to be in top shape this weekend. 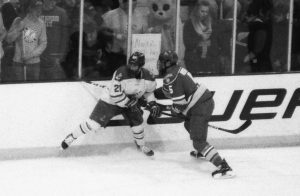 The Lakers have come out of the gate swinging, and I believe could be ranked higher both within the WCHA and nationally if it wasn’t for the plague of late goals. This Wildcat team won’t just lay down, especially with the rivalry the way it is. Puck drops both nights at 7:07pm. They can be heard locally at 99.5 YESfm, or online at www.yesfm.net or on TuneIn. You can see the action yourself at the Taffy Abel Arena, or online at Flohockey.tv. The Falcons this year have had an interesting schedule, having played 8 non-conference games, and only two series worth of WCHA play. Amongst those NC games, they split a home-and-home with Robert Morris, where the home team took the win, went up 3 points on #19 Western Michigan and dunked #4 Ohio State 8-2. This kind of play has landed them in the #10 spot this week, after splitting with Northern Michigan and forcing a tie & win with UAA. They are led in scoring by a trio of sophomores: Max Johnson (6-7-13), Brandon Kruse (3-10-13) and Connor Ford (6-5-11). Ryan Bednard looks to be their go-to netminder so far this season, having played in 9 of the 11 games. He currently has a 1.33 GAA and a .943 Save %. Eric Dop has similar numbers, though he does only have 3 goals against to Bednard’s 12. Chris Bergeron returns for his 9th season as the Falcons head coach, with a record of 146-143-39. The Lakers learned the hard way the above phrase. They both fought back against the Nanooks and was fought against. 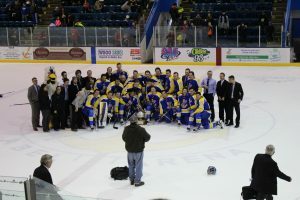 Even though it was stated both on this website along with other online outlets, the Nanooks were a better team than their record gave them credit for, but it doesn’t make the sweep any easier to swallow. Not only will the Lakers have to fight back against a very good Bowling Green team. The good news is that the Lakers tend to play pretty well against them, and have been some of the more fun games that I’ve been able to witness. There is one takeaway from the last couple of weeks that the coaching staff will need to clean up: Using the bottom two lines more. I don’t have the numbers, but it certainly seemed to me that the fourth line had maybe 4 minutes total last weekend, with the third getting just a few more. Yes, it’s great that the top 2 lines are firing on all cylinders, but history has proven, both in the NCAA and the NHL that you need to be able to roll all 4 lines to win championships. As always, the game will be on http://www.yesfm.net, or can be seen on Flohockey.tv. If you living near Bowling Green, please support your Lakers at the Slater Family Ice Arena. Puck drops at 7:37pm Friday and 7:07pm Saturday. Also, for those in the Sault, Laker Athletics will be hosting a viewing party at Buffalo Wild Wings starting at 7:30pm Friday. 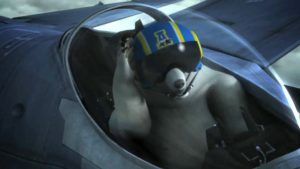 (Seriously, look up the Nanook’s old intro video). Alaska has had a very tough schedule to open their season which has only allowed them to score 9 points in 8 games. Their top three in scoring have a total of11 points between them, and only 3 goals. After lighting up Simon Fraser for 13, the Nanooks have faced Arizona State, #5 St. Cloud State, #9 Denver & #7 Minnesota State on the road, save for St. Cloud, which was played in Fairbanks. This week, they travel to the lower 48 yet again to Sault Sainte Marie. They bring in 10 Freshman, with only 4 seniors returning this season. Their head coach is a man named Erik Largen, who previously coached for Marian down in Division III hockey, where he went 18-4-4. The University of Alaska skates on a large Olympic sized ice sheet at home, so they are nearly always a good skating team, and with all the traveling they’ve done as part of the early season, they are a team that the Lakers can’t underestimate. Hell, they only lost to Denver in regulation once, losing in Overtime that Saturday night. 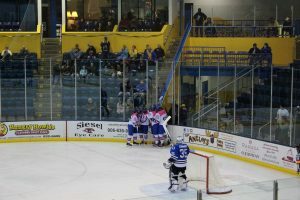 The Lakers have started their year out at 5-1, losing last Saturday to their former CCHA rivals, Michigan and their head coach Mel Pearson. They’ll be looking to built that momentum, and on paper, there doesn’t seem much that Alaska can really do to slow it down, but the team has to give it their all. The Laker’s scoring leaders are led by two seniors, Anthony Nellis (5-5-10) and Gage Torrel(0-7-7), followed closely by upstart freshman Jacob Nordqvist (1-5-6). Add in Hampus Eriksson, and you have 4 point-per-game players. The goaltending save % looks good for both Mitens and Kossoff, at .933 and .900 respectively. Their Goals Against Average is a bit subpar, as they’ve been getting peppered with shots. Whoever stands in net this weekend will have to try and stay awake and not let any soft goals in. From #4 to #12 – Hail to the…Victors? Michigan started the year off at #4 in the national polls, but slipped after a drumming put on by unranked Vermont, maintained their rank after beating Waterloo, but slipped to #9 before losing 6-3 to a stacked USNTP U-18 Team, then to #11 for their match with WMU. After splitting with #19 Western Michigan, they dropped to #12, even after sweeping St. Lawrence at home. The Wolverines return only two of their top 5 scorers this season: Defenseman Quinn Hughes and forward Jake Slaker. Their top scorer last season was Cooper Marody, a junior, but he decided to go pro, and is currently with the Edmonton Oilers organization. This will also be a homecoming of sorts for Luke Morgan, who decommitted from the Lakers after an outstanding freshman year. It just so happens that former Michigan Tech head coach, and Damon Whitten’s former boss Mel Pearson was tapped to replace longtime & Hall of Fame head coach Red Berenson. 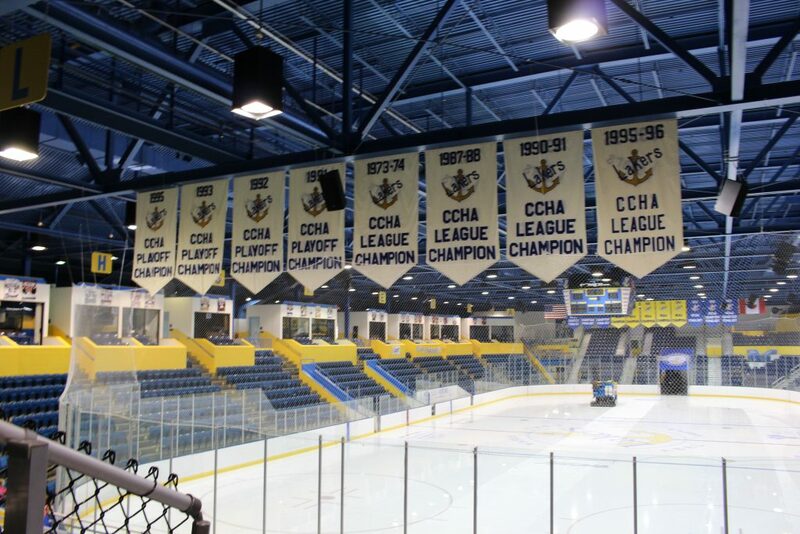 While this will not be the first time the Wolverines and Lakers have faced each other since the dissolution of the former CCHA, this will mark the first time Michigan has been back to Abel Arena since the 2012-2013 season, where the two teams split the weekend. There’s been some nervous optimism going through the fanbase here in the Sault going into this weekend, with the Lakers being 4-0 on the year and 6-0 counting the exhibition series. Of course, we’re hoping that the record goes to 6-0, especially considering that this weekend is Great Lake State Weekend! 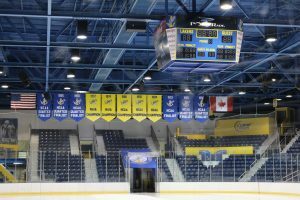 And we will have two Laker Legends in the house, being inducted into the LSSU Hall of fame: Former goaltender Darrin Madeley (1989-1992) and Mark Astley (1988-1992). Madeley had a fairly long post- college career, filling in for the Ottawa Senators. Astley played primarily in Switzerland, but had a few stints with the Buffalo Sabres. He also has his own banner hung up in Abel Arena, as he played with the Canadian National Team for 54 games, ultimately winning silver in the 1994 Lillehammer Olympics. This will be the first major test for the Lakers, going against a nationally ranked team. I don’t know if anyone can say that Michigan has more to lose than the Lakers have more to gain. Either way, it will be fun to see the blue and maize return to the Sault, and the stands ought to be packed. On Friday night, the puck will drop at 7:37pm at Taffy Abel Arena, and 7:07pm Saturday night. If you have not ordered your tickets, I would urge everyone to order ahead of time to 1) guarantee your seat, and 2) avoid the long lines. If you are not able to make it to the game, or you are out of town, you can listen to the Voice of the Lakers Bill Crawford on 99.5 YESfm over the air or online, or watch the game on FloHockey.tv. The Chargers of Alabama-Huntsville are off to a pretty rough start this year, opening their season with four straight road losses, then two more at home against Arizona State. To be fair, however, the road losses were all against NCHC powerhouse teams, having faced the top three teams in that conference. Mike Corbett returns as the bench boss, also returning are two of their top 4 points –getters in Defenseman Kurt Gosselin and Christian Rajic – Josh Kestner graduated last season, who was the top point-scorer, and Tyler Poulsen, who is now with the Rapid City Rush of the ECHL. The Chargers in the coaches’ poll came in 9th in voting, 5 points behind #7 LSSU. In the media poll, conducted by UAHhockey, however, they were chosen to be #7, 12 points ahead of #8 LSSU. While the preseason polls don’t really mean much, it does show that these two teams are behind the same eight-ball, and this series could help decide who gets into the playoffs come March. It was quite the offseason for the Lakers this summer. J.T Henke, Kyle Chatham, Aiden Wright and Ryan Renz all graduated, with Henke being the top scorer for the Lakers. Along with them, defenseman Matt McArdle graduated, and decided to transfer to Merrimack. 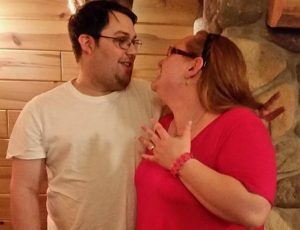 Luckily the reunion went our way. 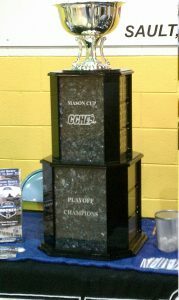 All of this was topped off with a four-year contract extension for bench boss Damon Whitten, the departure of longtime assistant coach Rich Metro to Shattuck-St. Marys and the hiring of Zack Cisek from Notre Dame. While the Lakers may have lost Henke, they have gained some talent in return. Many of the incoming freshman forwards have been noticeable on the ice. Looking at just the two Merrimack games, two freshmen, Pierre-Luc Veillette and Jacob Nordqvist are both tied for first in total points. They return all three goalies. While it sounds like the starting two are basically set in stone, Bengert certainly has a chance at starting at some point this season if either Kossoff or Mitens gets into a slump. This is also the first time in a while where it feels like the third goalie will really push the top two to be better & to keep their spot. All in all this is a good thing, and should make for an entertaining season.